Animals use muscles to convert the chemical energy of ATP into mechanical work. Three different kinds of muscles are found in vertebrate animals. Heart muscle — also called cardiac muscle — makes up the wall of the heart. Throughout our life, it contracts some 70 times per minute pumping about 5 liters of blood each minute. The contraction of smooth muscle is generally not under voluntary control. Skeletal muscle, as its name implies, is the muscle attached to the skeleton. It is also called striated muscle. The contraction of skeletal muscle is under voluntary control. origin to a large area of bone; in this case, the humerus. At its other end, the insertion, it tapers into a glistening white tendon which, in this case, is attached to the ulna, one of the bones of the lower arm. As the triceps contracts, the insertion is pulled toward the origin and the arm is straightened or extended at the elbow. Thus the triceps is an extensor. Because skeletal muscle exerts force only when it contracts, a second muscle — a flexor — is needed to flex or bend the joint. The biceps muscle is the flexor of the lower arm. Together, the biceps and triceps make up an antagonistic pair of muscles. Similar pairs, working antagonistically across other joints, provide for almost all the movement of the skeleton. Skeletal muscle is made up of thousands of cylindrical muscle fibers often running all the way from origin to insertion. The fibers are bound together by connective tissue through which run blood vessels and nerves. many nuclei (thus each skeletal muscle fiber is a syncytium). The multiple nuclei arise from the fact that each muscle fiber develops from the fusion of many cells (called myoblasts). The number of fibers is probably fixed early in life. This is regulated by myostatin, a cytokine that is synthesized in muscle cells (and circulates as a hormone later in life). Myostatin suppresses skeletal muscle development. (Cytokines secreted by a cell type that inhibit proliferation of that same type of cell are called chalones.) Cattle and mice with inactivating mutations in their myostatin genes develop much larger muscles. Some athletes and other remarkably strong people have been found to carry one mutant myostatin gene. These discoveries have already led to the growth of an illicit market in drugs supposedly able to suppress myostatin. In adults, increased muscle mass comes about through an increase in the thickness of the individual fibers and increase in the amount of connective tissue. In the mouse, at least, fibers increase in size by attracting more myoblasts to fuse with them. The fibers attract more myoblasts by releasing the cytokine interleukin 4 (IL-4). Anything that lowers the level of myostatin also leads to an increase in fiber size. although this tends to obscure the essential similarity in structure and function of these structures and those found in other cells. The nuclei and mitochondria are located just beneath the plasma membrane. 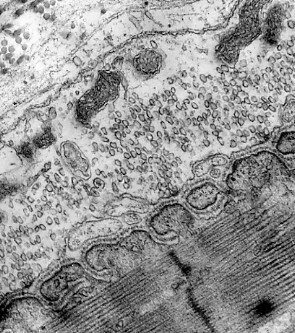 The endoplasmic reticulum extends between the myofibrils. 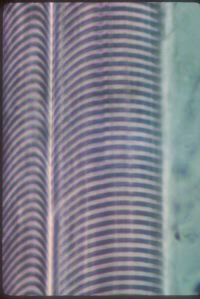 Seen from the side under the microscope, skeletal muscle fibers show a pattern of cross banding, which gives rise to the other name: striated muscle. The A bands are bisected by the H zone running through the center of which is the M line. The I bands are bisected by the Z disk. Each myofibril is made up of arrays of parallel filaments. The thick filaments have a diameter of about 15 nm. They are composed of the protein myosin. 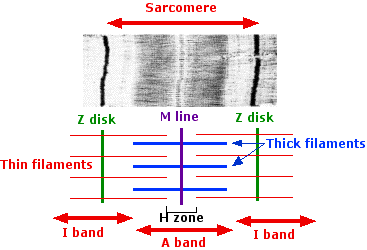 The entire array of thick and thin filaments between the Z disks is called a sarcomere. The thick filaments produce the dark A band. The thin filaments extend in each direction from the Z disk. Where they do not overlap the thick filaments, they create the light I band. The H zone is that portion of the A band where the thick and thin filaments do not overlap. The M line runs through the exact center of the sarcomere. Molecules of the giant protein, titin, extend from the M line to the Z disk. One of its functions is to provide elasticity to the muscle. It also provides a scaffold for the assembly of a precise number of myosin molecules in the thick filament (294 in one case). It may also dictate the number of actin molecules in the thin filaments. The contraction of skeletal muscle is controlled by the nervous system. The Dying Lioness (an Assyrian relief dating from about 650 B.C. and supplied through the courtesy of The Trustees of the British Museum) shows this vividly. Injury to the spinal cord has paralyzed the otherwise undamaged hind legs. In this respect, skeletal muscle differs from smooth and cardiac muscle. Both cardiac and smooth muscle can contract without being stimulated by the nervous system. Nerves of the autonomic branch of the nervous system lead to both smooth and cardiac muscle, but their effect is one of moderating the rate and/or strength of contraction. The terminals of motor axons contain thousands of vesicles filled with acetylcholine (ACh). Many of these can be seen in the electron micrograph on the left (courtesy of Prof. B. Katz). When an action potential reaches the axon terminal, hundreds of these vesicles discharge their ACh onto a specialized area of postsynaptic membrane on the muscle fiber (the folded membrane running diagonally upward from the lower left). This area contains a cluster of transmembrane channels that are opened by ACh and let sodium ions (Na+) diffuse in. The interior of a resting muscle fiber has a resting potential of about −95 mV. The influx of sodium ions reduces the charge, creating an end plate potential. If the end plate potential reaches the threshold voltage (approximately −50 mV), sodium ions flow in with a rush and an action potential is created in the fiber. The action potential sweeps down the length of the fiber just as it does in an axon. Link to another view of these events. No visible change occurs in the muscle fiber during (and immediately following) the action potential. This period, called the latent period, lasts from 3–10 msec. the field is cleared for the arrival of another nerve impulse. the resting potential of the fiber is restored by an outflow of potassium ions. The brief (1–2 msec) period needed to restore the resting potential is called the refractory period. The process of contracting takes some 50 msec; relaxation of the fiber takes another 50–100 msec. Because the refractory period is so much shorter than the time needed for contraction and relaxation, the fiber can be maintained in the contracted state so long as it is stimulated frequently enough (e.g., 50 stimuli per second). Such sustained contraction is called tetanus. When shocks are given at 1/sec, the muscle responds with a single twitch. At 5/sec and 10/sec, the individual twitches begin to fuse together, a phenomenon called clonus. At 50 shocks per second, the muscle goes into the smooth, sustained contraction of tetanus. Clonus and tetanus are possible because the refractory period is much briefer than the time needed to complete a cycle of contraction and relaxation. Note that the amount of contraction is greater in clonus and tetanus than in a single twitch. As we normally use our muscles, the individual fibers go into tetanus for brief periods rather than simply undergoing single twitches. Activation of the muscle fiber causes the myosin heads to bind to actin. An allosteric change occurs which draws the thin filament a short distance (~10 nm) past the thick filament. Then the linkages break (for which ATP is needed) and reform farther along the thin filament to repeat the process. As a result, the filaments are pulled past each other in a ratchetlike action. There is no shortening, thickening, or folding of the individual filaments. Electron microscopy supports this model. there is no change in the width of the A band. but there is still no change in the width of the A band. This is seen in these electron micrographs (courtesy of Dr. H. E. Huxley). Other evidence supporting the sliding-filament model is presented on another page. Link to it. Calcium ions (Ca2+) link action potentials in a muscle fiber to contraction. In resting muscle fibers, Ca2+ is stored in the endoplasmic (sarcoplasmic) reticulum. Spaced along the plasma membrane (sarcolemma) of the muscle fiber are inpocketings of the membrane that form "T-tubules". These tubules plunge repeatedly into the interior of the fiber. The T-tubules terminate near the calcium-filled sacs of the sarcoplasmic reticulum. Each action potential created at the neuromuscular junction sweeps quickly along the sarcolemma and is carried into the T-tubules. The arrival of the action potential at the ends of the T-tubules triggers the release of Ca2+. binds to troponin on the thin filaments. This turns on the interaction between actin and myosin and the sarcomere contracts. Because of the speed of the action potential (milliseconds), the action potential arrives virtually simultaneously at the ends of all the T-tubules, ensuring that all sarcomeres contract in unison. When the process is over, the calcium is pumped back into the sarcoplasmic reticulum using a Ca2+ ATPase. If a stimulated muscle is held so that it cannot shorten, it simply exerts tension. This is called an isometric ("same length") contraction. If the muscle is allowed to shorten, the contraction is called isotonic ("same tension"). All motor neurons leading to skeletal muscles have branching axons, each of which terminates in a neuromuscular junction with a single muscle fiber. Nerve impulses passing down a single motor neuron will thus trigger contraction in all the muscle fibers at which the branches of that neuron terminate. This minimum unit of contraction is called the motor unit. In contrast, a single motor unit for a muscle like the gastrocnemius (calf) muscle may include 1000–2000 fibers (scattered uniformly through the muscle). Although the response of a motor unit is all-or-none, the strength of the response of the entire muscle is determined by the number of motor units activated. ATP is the immediate source of energy for muscle contraction. Although a muscle fiber contains only enough ATP to power a few twitches, its ATP "pool" is replenished as needed. There are three sources of high-energy phosphate to keep the ATP pool filled. cellular respiration in the mitochondria of the fibers. The phosphate group in creatine phosphate is attached by a "high-energy" bond like that in ATP. Creatine phosphate derives its high-energy phosphate from ATP and can donate it back to ADP to form ATP. The pool of creatine phosphate in the fiber is about 10 times larger than that of ATP and thus serves as a modest reservoir of ATP. Skeletal muscle fibers contain about 1% glycogen. The muscle fiber can degrade this glycogen by glycogenolysis producing glucose-1-phosphate. This enters the glycolytic pathway to yield two molecules of ATP for each pair of lactic acid molecules produced. Not much, but enough to keep the muscle functioning if it fails to receive sufficient oxygen to meet its ATP needs by respiration. However, this source is limited and eventually the muscle must depend on cellular respiration. Cellular respiration not only is required to meet the ATP needs of a muscle engaged in prolonged activity (thus causing more rapid and deeper breathing), but is also required afterwards to enable the body to resynthesize glycogen from the lactic acid produced earlier (deep breathing continues for a time after exercise is stopped). The body must repay its oxygen debt. Several different types of muscle fiber can be found in most skeletal muscles: Type I and and 3 subtypes of Type II fibers. Each type differs in the myosin it uses and also in its structure and biochemistry. dominant in muscles used for rapid movement, e.g., those moving the eyeballs. The other subtypes of Type II fibers have properties intermediate between those of Type IIb and Type I. Most skeletal muscles contain some mixture of Type I and Type II fibers, but a single motor unit always contains one type or the other, never both. In mice, the number of Type I vs Type II fibers can be changed with exercise and drug treatment. Whether the same holds true for humans remains to be seen. Perhaps training in humans does not alter the number of fibers of a particular type but may increase the diameter of one type (e.g., Type I in marathoners, Type IIb in weight lifters) at the expense of the other types. Cardiac or heart muscle resembles skeletal muscle in some ways: it is striated and each cell contains sarcomeres with sliding filaments of actin and myosin. However, cardiac muscle has a number of unique features that reflect its function of pumping blood. The myofibrils of each cell (and cardiac muscle is made of single cells — each with a single nucleus) are branched. The branches interlock with those of adjacent fibers by adherens junctions. These strong junctions enable the heart to contract forcefully without ripping the fibers apart. This electron micrograph (reproduced with permission from Keith R. Porter and Mary A. Bonneville, An Introduction to the Fine Structure of Cells and Tissues, 4th ed., Lea & Febiger, Philadelphia, 1973) shows an adherens junction and several of the other features listed here. The action potential that triggers the heartbeat is generated within the heart itself. Motor nerves (of the autonomic nervous system) do run to the heart, but their effect is simply to modulate — increase or decrease — the intrinsic rate and the strength of the heartbeat. Even if the nerves are destroyed (as they are in a transplanted heart), the heart continues to beat. The action potential that drives contraction of the heart passes from fiber to fiber through gap junctions. Significance: all the fibers contract in a synchronous wave that sweeps from the atria down through the ventricles and pumps blood out of the heart. Anything that interferes with this synchronous wave (such as damage to part of the heart muscle from a heart attack) may cause the fibers of the heart to beat at random — called fibrillation. Fibrillation is the ultimate cause of most deaths, and its reversal is the function of defibrillators that are part of the equipment in ambulances, hospital emergency rooms, and even on U.S. air lines. The refractory period in heart muscle is longer than the period it takes for the muscle to contract (systole) and relax (diastole). Thus tetanus is not possible (a good thing, too!). Cardiac muscle has a much richer supply of mitochondria than skeletal muscle. This reflects its greater dependence on cellular respiration for ATP. Cardiac muscle has little glycogen and gets little benefit from glycolysis when the supply of oxygen is limited. Thus anything that interrupts the flow of oxygenated blood to the heart leads quickly to damage — even death — of the affected part. This is what happens in heart attacks. Link to description of the anatomy of the human heart. Link to discussion of the heartbeat. Smooth muscle is made of single, spindle-shaped cells. It gets its name because no striations are visible in them. Nonetheless, each smooth muscle cell contains thick (myosin) and thin (actin) filaments that slide against each other to produce contraction of the cell. The thick and thin filaments are anchored near the plasma membrane (with the help of intermediate filaments). Smooth muscle (like cardiac muscle) does not depend on motor neurons to be stimulated. However, motor neurons (of the autonomic system) reach smooth muscle and can stimulate it — or relax it — depending on the neurotransmitter they release (e.g. noradrenaline or nitric oxide, NO)). Example: oxytocin reaching the uterus stimulates it to contract to begin childbirth. The contraction of smooth muscle tends to be slower than that of striated muscle. It also is often sustained for long periods. This, too, is called tonus but the mechanism is not like that in skeletal muscle. Together myosin, actin, tropomyosin, and troponin make up over three-quarters of the protein in muscle fibers. Some two dozen other proteins make up the rest. These serve such functions as attaching and organizing the filaments in the sarcomere and connecting the sarcomeres to the plasma membrane and the extracellular matrix. Mutations in the genes encoding these proteins may produce defective proteins and resulting defects in the muscles. Among the most common of the muscular dystrophies are those caused by mutations in the gene for dystrophin. The gene for dystrophin is huge, containing 79 exons spread out over 2.4 million base pairs of DNA. Thus this single gene represents about 0.1% of the entire human genome (3 x 109 bp) and is almost half the size of the entire genome of E. coli! Deletions or nonsense mutations that cause a frameshift usually introduce premature termination codons (PTCs) in the resulting mRNA. Thus at best only a fragment of dystrophin is synthesized and DMD, a very severe form of the disease, results. If the deletion simply removes certain exons but preserves the correct reading frame, a slightly-shortened protein results that produces BMD, a milder form of the disease. The gene for dystrophin is on the X chromosome, so these two diseases strike males in a typical X-linked pattern of inheritance. Deletions of one or more exons in the huge dystrophin gene are the cause of most of the cases of DMD. Exon 50 is a particularly notorious offender. 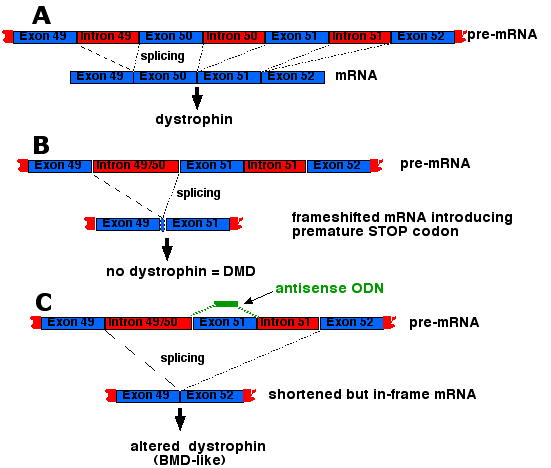 When it is deleted, splicing of the pre-mRNA introduces a frameshift which then introduces a premature termination codon resulting in no functional dystrophin synthesized ("B"). However, an antisense oligonucleotide targeted to exon 51 causes the splicing mechanism to skip over it resulting in the stitching together of exons 49 and 52. This restores the correct reading frame so that only a slightly-altered version of dystrophin is produced, i.e., a BMD-type dystrophin ("C"). Seventeen weeks of weekly injections of 12 young DMD patients in the Netherlands with the oligonucleotide caused their muscles to synthesize sufficient amounts of dystrophin to enable 8 of them to walk better than before. (See Goemans, N., et al., in the 21 April 2011 issue of The New England Journal of Medicine. Three research groups have used the CRISPR-Cas9 genome editing system to remove a mutated exon in DMD mice. The treatment restored dystrophin synthesis and improved skeletal and cardiac muscle function in the mice. Myasthenia gravis is an autoimmune disorder affecting the neuromuscular junction. Patients have smaller end plate potentials (EPPs) than normal. With repeated stimulation, the EPPs become too small to trigger further action potentials and the fiber ceases to contract. Administration of an inhibitor of acetylcholinesterase temporarily can restore contractility by allowing more ACh to remain at the site. A disease resembling myasthenia gravis can be induced in experimental animals by immunizing them with purified ACh receptors. Anti-ACh receptor antibodies are found in the serum of human patients. Experimental animals injected with serum from human patients develop the signs of myasthenia gravis. Newborns of mothers with myasthenia gravis often show mild signs of the disease for a short time after their birth. This is the result of the transfer of the mother's antibodies across the placenta during gestation. The reason some people develop autoimmune antibodies against the ACh receptor is unknown. The severity of the disease varies with the particular mutation causing it (over 100 have been identified so far) . Some mutations are sufficiently dangerous that they can lead to sudden catastrophic heart failure in seemingly healthy and active young adults.